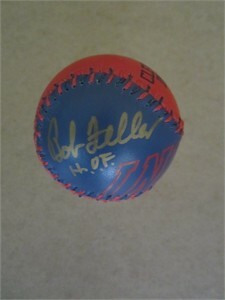 Home»Sports Autographs»Retired Baseball Player Autographs»Bob Feller autographed Cleveland Indians baseball inscribed H.O.F. Cleveland Indians blue and red Spinneybeck leather logo baseball autographed in gold paint by the late, legendary Hall of Fame pitcher Bob Feller and inscribed H.O.F. ONLY ONE AVAILABLE FOR SALE. With certificate of authenticity from AutographsForSale.com.